People brush their teeth every day in hopes that when they arrive at their annual dentist appointment, they do not have any problems with their dental health. This same concept can be applied to system management. By scheduling routine check-ups and fixing problems before they become irreversible, companies are performing proactive maintenance. This practice ensures that companies not only eliminate surprises that could result in downtime but also optimize their network use. By scheduling routine check-ups for hardware, businesses can guarantee that their machines are reliable and last as long as possible. Often, hardware gets dirty over time from dust and debris in the office. Routine check-ups ensure that the machines are cleaned frequently and are up-to-date with software. According to Utility Products, there is never a definite time when it comes to maintenance. Therefore, taking a proactive approach is the only way to effectively protect machinery. Proactive maintenance can result in an increase in productivity within the workplace. When the system is running efficiently, employees can perform their responsibilities in a timely manner. Without routine maintenance, problems in the network can arise without warning and take days to fix, which ultimately results in downtime for a business. Small network issues are easier and cheaper to fix than large problems. According to Business News Daily, routine system check-ups are the best way to predict when network problems will occur. On average, MDL Technology notices a 10 percent return on investment for our clients through proactive maintenance. This is a direct result of fixing small issues before they become costly. 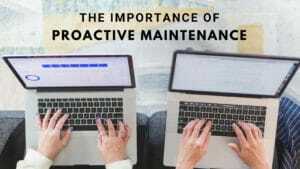 Overall, investing in proactive maintenance decreases the risk for an expensive fix in the future. For more information about proactive maintenance and how it could benefit your company in the long term, visit MDL Technology’s website.